Chail is one of the famous tourist locations in India, located in Himachal Pradesh. Chail is situated in the lap of nature with full of flora and fauna, and 2,000 m high above the sea level. It is also considered as an agreeable Hindu religious destination with several spiritual praying houses. Kali Ka Tibba is one of the famous tourist places in Chail, and even for locals as the main deity. Located above mountain, it is named after the Rajmata's cottage-Blossom. And the place gives the panoramic view of the vulnerable Shiwalik Range and the mighty Choor Chandni peak. Siddh Baba Ka Mandir was renovated 4 years ago. According to the priest of the temple, Pawan Sharma, there were countless difficulties came across while building up the temple as it is built in the Chail Wildlife Sanctuary. 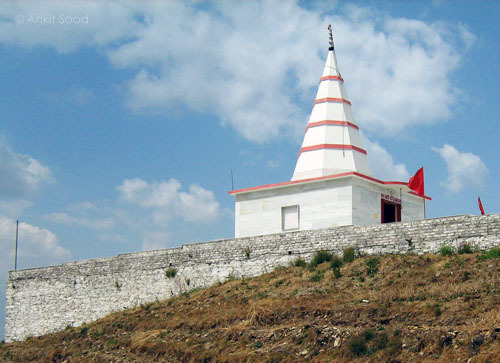 Kali Devi Ka Mandir is built on the third hillock with the backdrop of snow clad Himalayas. Apart from these above mentioned spiritual temples, Chail has several another places to enjoy the vacations like Chail Palace, Chail Wildlife Sanctuary, and World’s Highest Cricket Ground. How to reach to Kali Ka Tibba: The temple can be reached by half an hour drive from Chail through the Guada road and for adventure seekers, it is like a paradise. Hiring the cab is usually recommended to enjoy the trip to Chail, Kali Ka Tibba not only provides the tourists with the spiritual peace but also the scenic natural beauty.